Welcome to the first edition of Energy Efficient West Virginia's Quarterly Newsletter "The Quarterly Energy Connection"! We feature information and articles relating to improving energy efficiency in WV. Below are this quarter's featured articles, please use the table of contents below to navigate. 5 Join us, we need your support! Energy Efficient West Virginia (EEWV) has been hard at work recently preparing for two new energy saving competitions in West Virginia: The Non-Profit Efficiency Engagement Program and Energy Efficient Charleston. Energy efficiency can help improve a number of problems facing our state, such as high unemployment and lowering bills for people struggling in today’s economy. While EEWV is always working to create new efficiency programs and policies, we also need to raise awareness about existing programs. While there are not many programs for customers of FirstEnergy’s utilities (Mon Power or Potomac Edison) to participate in, AEP/Appalachian Power customers have some programs that could use greater participation. In EEWV’s experience, the easiest path to becoming more energy efficient is to gain knowledge about the best first steps. That’s why we have focused our community engagement programs on taking advantage of AEP’s free home energy assessments. For a home energy assessment, an expert goes through a customer’s home and recommends the most cost-effective efficiency upgrades. This gives homeowners a list of priorities, so they can make upgrades as it is convenient and within their budget. Unfortunately, too few AEP customers are aware of this program or just how effective it can be. To grow awareness about energy efficiency and help increase participation in the energy assessments program, EEWV has been moving forward with the two competitions: Energy Efficient Charleston (EEC) began in December of 2015 and is going until November of this year. It is a citywide, yearlong competition to see which neighborhood can save the most energy. For the past two years, EEWV held a block-vs.-block competition in the East End. For that competition, blocks saved up to 30% on their energy use! Now residents can unite to compete against the other neighborhoods in Charleston such as the South Hills, West side, Kanawha City, and East End to see who can save the most energy. Being part of the competition allows us to give participants energy savings tips, as well as discounts on efficiency upgrades from our partner contractor, Mr. Handyman of the Kanawha Valley. If you live in Charleston, take 90 seconds to sign up to be part of the competition, or if you know someone who lives in Charleston, send them the sign up info! There’s no long-term commitment; signing up just means you get counted with your neighbors in the energy saving competition. EEWV encourages every participant to at least get their free energy assessment and will help connect people to resources, advice, and ways to save! To sign the pledge to save energy, go to bit.ly/eecsignup! One of the keys we have found to effectively save energy at home is to get a home energy audit for free from Appalachian Power Co. This helps you itemize what it is you need to do to start saving, create a plan for moving forward, and start to save take control of your energy bills. Our other competition, The Non-Profit Efficiency Engagement Program, deals specifically with getting more people to have their home energy assessment. EEWV negotiated to have AEP take part in this competition as a part of the settlement in the Mitchell Power Plant transfer case. This program helps nonprofits that own their buildings by giving them $10 credit when people participate in the HomeSMART energy audit. So, a non-profit signs up to participate, encourages members and friends to get a free home energy audit from Appalachian power, and can use the $10 credits it collects to make energy upgrades to its building. All participating nonprofits will get their $10 credit per participant, but the winning non-profit with the most participants over 100 will win a $10,000 energy efficiency upgrade. Go to takechargewv.com to sign up for your FREE home energy Audit today! Let us know how we can help you in your effort to reduce energy bills. Wherever you live in the state, we’re here to help you cost-effectively save energy! Contact us by phone at 304.346.5891 or by email at andy@eewv.org. Shane Wilson is an attorney and an up-and-coming real estate professional who lives a few steps from the WV CAG office. Shane has perhaps the broadest view of the real estate market in Charleston, as he works full-time for West Virginia Commercial Real Estate, one of the largest commercial real estate companies in the area, and is also a landlord of several residential rental properties in the city. Recently, Shane purchased an 11-unit property on Charleston’s East End neighborhood. He plans to honor the rich history of the property and make the property an attractive place for young professionals to live. The East End of Charleston has been described as the closest thing that West Virginia has to the hipster-filled Brooklyn, NY. There are the perks of city life: walkable restaurants, coffee shops, and a hip record store. But, like most of the state, it is not far from fantastic natural places such as the New River Gorge. The neighborhood has some historic homes and apartment buildings, some of which have fallen into disrepair and/or have outdated fixtures. 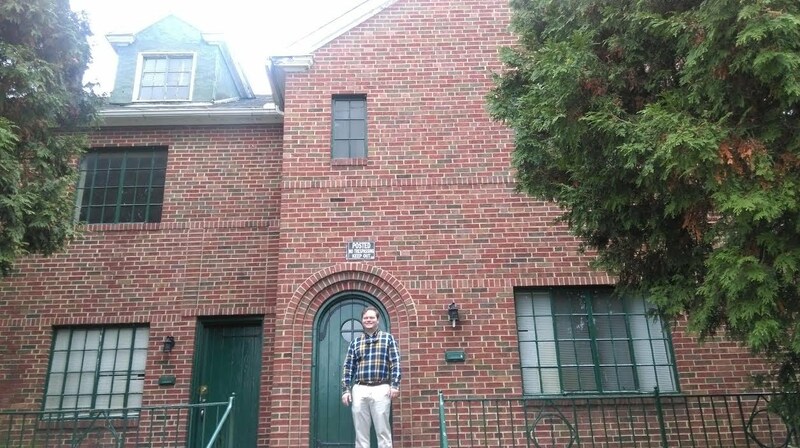 Shane’s property, called Jackson Terrace, was built in the 1940s by Mr. Drasnin, a Jewish immigrant from France, fleeing anti-Semitic sentiment in Europe at the time. The building has much of the original fixtures, though some have been covered over the years. One thing that has not changed much is that building has not gotten much more efficient since the 1940s. This is one of the important upgrades that Shane wants to make; he wants to be able to let his tenants know that, while they will live in a historic building, they will have modern efficiency measures in place to keep them comfortable and energy bills low. For responsible landlords like Shane, it can be daunting to figure out how to finance the improvements. To modify an old cliché, “you gotta spend money to save money!” One option is for Shane to use his own savings to make the upgrades, but that can be an impediment on him being able to invest in other, new properties, that can give a greater return than he can get on energy efficiency upgrades in this one building. The other option that Shane has is to go to the bank and borrow, using his own credit, to make the upgrades. But borrowing money can affect his credit. Depending on his current financial position, that may be the best option for him, but for many investors, it would be more attractive to let the energy savings take the debt load. In other words, to have energy savings be the “backing” for the debt, without having to impact the personal equity. In most states, he would be able to do so through a funding mechanism being considered by the West Virginia Legislature. The Local Energy Efficiency Partnership (LEEP) Act is modeled after legislation enacted by 30 states, plus the District of Columbia. From Shane’s perspective, the bill would allow him to make energy efficiency upgrades and repay them on his tax ticket. From a private financial institution’s perspective, it would allow them to make money by charging interest for bonds backed by energy savings. Here’s how it could work for Shane, if the bill passes and the local government chooses to participate in the program: First, Shane would get an investment-grade energy audit. The audit would identify the energy efficiency upgrades that will be most cost-effective and would save more than they would cost, if repaid over a time period that Shane identifies. Then, Shane would take the audit results and an application fee, and submit them to the City of Charleston or Kanawha County. As is alluded to above, this is all assuming that the City of Charleston and/or Kanawha County chooses to participate in this program; local governments have to choose to make this option available to their commercial building owners. The local government would take the application and turn it into a bond, for sale on the bond market, likely bundling it with other properties making similar upgrades, to be sold together. The bonds are backed by the energy savings, not by the local government’s credit. Then, the bonds are purchased by investors, the funds are used to make the upgrades, and Shane pays for the upgrades when he pays his taxes. The payments are required to be lower than the amount of energy savings Shane gets from them. At a recent summit of energy efficiency leaders and businesses, the LEEP Act was identified as the top priority for helping facilitate energy efficiency upgrades in the state. In 2015, the bill received strong bipartisan support in both the West Virginia House and Senate. EEWV believes that there is excellent momentum for the bill going into this session, but could use your support and assistance. Please sign up for our email list and consider joining EEWV as a member. The Public Service Commission (PSC) only had two of the three mandated commissioners for most of 2015, but that did not stop them from taking on some very important cases, not to mention approving large rate increases. EEWV intervenes at the PSC to promote energy efficiency programs at the electric utilities. .
EEWV has been continuing to fight for better programs at both major utilities in the state. With the EPA‘s Clean Power Plan in the process of being implemented, utilities have a strong incentive to begin planning to increase energy efficiency greatly to meet the mandates in the most cost-effective manner. In 2014, the legislature tasked the PSC and utilities to create integrated resource plans (IRPs) for meeting energy needs, considering demand alongside generation. The PSC issued an order in March of 2015, telling the utilities that they must issue IRPs, and leaving open the possibility that they may have to revise those IRPs in light of the Clean Power Plan. The utilities will initiate new PSC cases for their plans by the end of the year. In the first half of the year, EEWV intervened in Appalachian and Wheeling Power‘s (AEP‘s) recent energy efficiency case. EEWV negotiated in the 2014 purchase of the Mitchell Power Plant that AEP would request an increase in funding to $10 million annually in its 2015 energy efficiency case. EEWV asked the PSC to order several improvements of AEP‘s efficiency programs, but it turned out that the previously negotiated increase in spending was the only concrete improvement to AEP‘s program. There was some silver lining in the final order at the PSC, however. The PSC specifically did not preclude the possibility that it may act in the future on certain issues. It said it is willing to consider a joint natural gas and electric efficiency program and/or allowing participation in all of AEP‘s electric utility programs for those who heat with natural gas, and did not rule out the possibility of having an energy efficiency case after the utility issues its integrated resource plan. On August 14, 2015, FirstEnergy‘s West Virginia utilities, Mon Power and Potomac Edison, filed for another rate increase, of approximately 12.5%. Most alarmingly, FirstEnergy sought to actually reduce its spending on energy efficiency. Unlike AEP, which is now spending $10 million each year on energy efficiency, FirstEnergy is slated to spend less than $2.6 million, despite having more customers than AEP. EEWV advocated for better efficiency programs at FirstEnergy‘s West Virginia utilities, which lag far behind AEP, and utilities in bordering states. Certain parties in the case successfully argued against EEWV being able to increase energy efficiency spending in this particular case, however, so that delayed the issue until a case that FirstEnergy will file in March of 2016. EEWV was, however, able to negotiate two small improvements. The first is that in 2016, FirstEnergy will hold stakeholder meetings to allow input from the public and parties that are affected by its efficiency programs; this will empower EEWV to be engaged in the process and offer suggestions early. Additionally, FirstEnergy will now participate in an important energy efficiency study, being conducted by Marshall University and the West Virginia Homebuilders Charitable Fund; the study will determine how homebuilders across the state are following the energy code. While EEWV was unable to increase spending by FirstEnergy, we are planning to be active participants in FirstEnergy’s case in March of 2016, and advocate for much stronger increases in spending than FirstEnergy currently plans to spend. Hello members and supporters of EEWV, my name is Andy White. I‘m Energy Efficient West Virginia‘s (EEWV) new Outreach Coordinator AmeriCorps VISTA. I was born in Washington DC, but moved to West Virginia at an early age. I have lived most of my life here in Charleston, and graduated from George Washington High School. Next I spent a while in Shepherdstown, WV attending Shepherd University, graduating in 2013 with a Bachelor of Fine Arts in Painting/Drawing. Since moving back to the Charleston area, I have worked for some state agencies and Taylor Books. I have stayed involved in various groups and organizations dedicated to bringing more arts and culture to the region. I am working on EEWV’s community efforts to help West Virginians save money by increasing participation in Appalachian Power’s energy-saving programs, and running the Energy Efficient Charleston competition in Charleston. I‘m excited to be here and to have this opportunity to work with all of you! Let‘s make ourselves as energy efficient as possible in coming years! Feel free to contact me at andy@eewv.org anytime. Join us, we need your support! EEWV is launching a membership program. In the future, there will be a variety of membership levels, but we are starting out with individual annual memberships for $50. Membership helps us continue our work fostering and advocating on behalf of a more efficient state. In 2016, there will be many challenges and opportunities, from the implementation of the Clean Power Plan to a major case regarding Mon Power and Potomac Edison's energy efficiency policies. All contributions are tax deductible. Click here to donate to EEWV through our fiscal sponsor, the WV Citizen Action Education Fund.